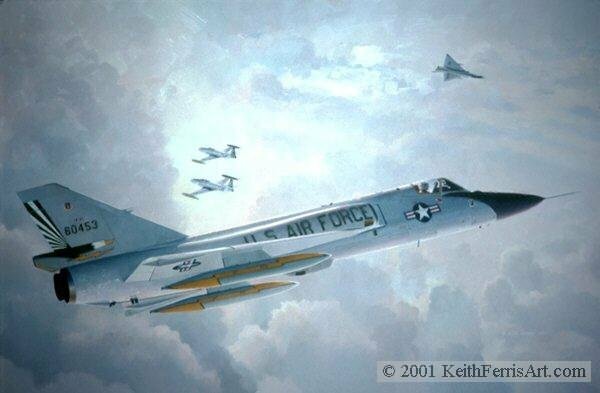 Capable of speeds in excess of 1400 mph, two Convair F-106A "Delta Darts" and two subsonic Lockheed T-33 "T-Birds" of the 49th Fighter Interceptor Squadron, Griffiss AFB, New York, meet in a 1986 training intercept high in the cloudscape above upstate New York. The 49th FIS is proud to have been the last active duty Air Force Squadron to fly "The Six". First flown on 26 December 1956, the 106 had served three decades as one of America's most important manned interceptors.